This tuna pasta bake is a super satisfying savory and crunchy dish. The recipe hails from o'er the pond from my British friend, John. He loves to cook! 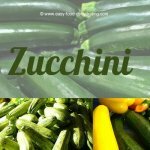 If you're interested in making this recipe, or any of our mouth-watering recipes with fresh ingredients instead of dehydrated, please consider getting our eBook shown in the pink block farther down the page. 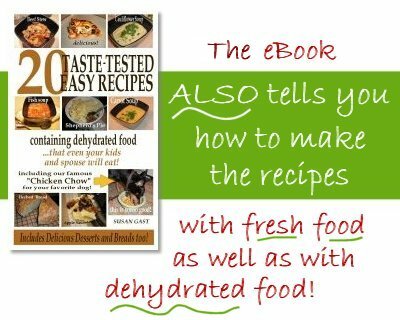 The eBook not only lists the quantities of dehydrated food in each recipe, it also lists the fresh ingredient amounts too! 1. Re-hydrate the onion, garlic, and mushrooms in a jug of cold water. 2. Drain the tuna as best you can in the kitchen sink, use a sieve. 3. Cook the pasta in the vegetable stock for TEN minutes, no more! Drain, place in oven-safe dish. 4. While the pasta is cooking, in a saucepan with about a tablespoon or two of olive oil, fry your breadcrumbs until golden and crisp. Takes a couple of minutes. Remove from pan and put aside in a small dish. 5. In the now-empty saucepan, add about 2 tablespoons olive oil, sauté the onion, garlic and mushrooms, until soft. Add the can of tomatoes, and Italian herbs, to taste. Add black pepper, to taste. Simmer for ten minutes. 6. Add the two cans of tuna to the pasta, and combine – breaking up the bigger tuna pieces. Add the sauce. Next, add the crème fraîche (or sour cream, or plain yogurt), stir gently! 7. Smooth out the pasta and sauce, and add the grated cheese as a layer. 8. Add the breadcrumbs on top of the cheese. 9. Bake, uncovered, at 350°F for 30 minutes. This fantastic tummy-pleasin' dish came to us from Grandpa Yogi otherwise known as John, in Derbyshire, UK! Thanks for sharing this fantastic dish with us, John! He says "there's nothing like the sound of the breadcrumbs' crunch as your spoon dips down into the creamy pasta". And we couldn't agree more. 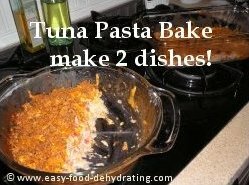 This Tuna Pasta Bake is now on our family's fave food list! Our test kitchen (yeah, right ... meaning "me") cooked this up from 'start to eaten' in about an hour – plus there was enough (in my humble opinion) to have two separate dishes – and the 2nd dish was devoured by my parents :-) They just phoned to say how much they enjoyed it! I hope this filling dish will become one of your family's favorites too!